The Charmed Pie Shoppe mysteries have been on my to-read list for quite some time. I generally don’t like to jump into a series without reading from the beginning, but I make exceptions at times. 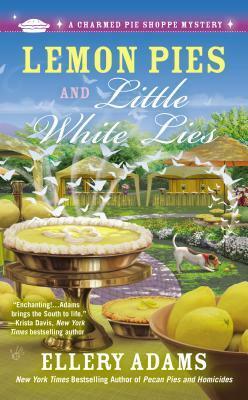 Like famed Southern hospitality, Lemon Pies and Little White Lies was a welcoming story that invited me in and made me feel right at home. At the heart of the story (and the series) is Ella Mae LeFaye and her popular pie shop. Just reading about the sweet and savory pies Ella Mae was preparing made my mouth water. But Ella Mae puts more than just fresh ingredients and passion into her pies; in fact, the whole town of Havenwood is brimming with magic. In Lemon Pies and Little White Lies, Ella Mae and her family are caught up in a magical mystery with very deadly ramifications. The action builds to a fever pitch that not only threatens Ella Mae and those she loves, but also all that she holds dear. Lemon Pies and Little White Lies – and the whole Charmed Pie Shop series – is perfect for readers who like a little romance and magic with their servings of mystery. My thanks to the author for gifting me an advance copy of this book in exchange for an honest review. This book was a lot of fun! I really did enjoy it. Hugh’s part in the book just made me sad. And a little bit angry I think. I can’t wait to read the next book!